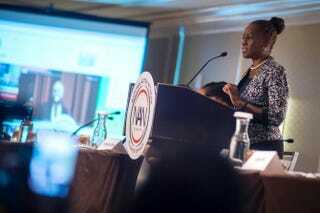 First Lady Chirlane McCray delivers opening remarks for a panel discussion on Mental Health as a part of the National Action Network annual conference. Sheraton Times Square Hotel, New York City, April 13, 2016. There was a packed house in the Empire Ballroom of the Sheraton New York Times Square for the Rev. Al Sharpton’s National Action Network’s silver-anniversary convention Wednesday. The panel, “I Don’t Need to See A Doctor: Mental Health in the African-American Community,” reportedly came about because Sharpton would repeatedly hear those words when he would try to refer his radio-program callers to a professional. Even the panel name, “I Don’t Need to See a Doctor,” was chosen deliberately to speak very specifically to the black community, as moderator and author Terrie Williams noted. The name touches on denial—that is, I don’t have a problem. It speaks to the belief that as long as we have religion, we don’t need to get help or treatment from a medical professional. Lastly, it reflects the deep distrust of the medical profession that is culturally embedded in our community for very specific and justifiable reasons. The first lady of New York City, Chirlane McCray, kicked off the panel with a brief discussion of mental health in general and what her $1 billion, four-year initiative to combat it in New York, ThriveNYC, looks like on the ground. ThriveNYC seeks to make mental-health services easier to access for the 1 in 5 New Yorkers who have a diagnosable mental illness. McCray candidly spoke of her parents—her father, a World War II veteran from the Deep South, and her mother, the child of Caribbean immigrants—both of whom suffered from bouts of depression when she was a child. The first lady noted that back then, most people didn’t talk about their pain. “But those silences spoke volumes,” she said. McCray added that having a parent suffer from a mental illness takes a “tremendous toll” on the individual, their families and the community at large. “We’re all touched by this,” she said. The first lady, who has also been very vocal about her daughter’s fight with depression, anxiety and substance misuse, says that mental illness can “ripple through generations and communities, making it a ‘multiplier of pain,’” therefore making it harder to maintain relationships, jobs, a home. “So really, mental illness is not just a health issue—it’s a housing issue, it’s an education issue, it’s a criminal-justice issue, it’s a social-justice issue,” said McCray. Moderator, mental-health advocate and author Williams, who wrote Black Pain: It Just Looks Like We’re Not Hurting, movingly spoke during her remarks of “the mask” that so many of us wear to cover our pain. “We wear the mask, we teach our children to wear the mask,” said Williams. “But it gets hot underneath the mask.” She talked about once and for all putting to rest the myth of the superwoman (“You will die trying to be a superwoman”) and says it’s imperative that we redefine the word “strong.” “Strong means asking for help,” said Williams. After asking those in the audience and on the panel to raise their hands if they had been to therapy (most of the panel, and many in the audience, had), Williams said that the key to healing is to “share our stories” with one another. The panelists represented all aspects of the mental-health community and those who fight for it in different ways: the Rev. Dominique Atchison, a minister at Brooklyn, N.Y.’s famous Brown Memorial Baptist Church; Tonya Odums, a licensed social worker and therapist; Kenyatta Reid, senior director of School Culture and Climate for New York City’s Department of Education; Dr. Regine Bruny-Olawaiye, a psychiatrist and medical director of the NYC Mental Health Corps; and Dr. Kenneth Ashley, a psychiatrist at Mount Sinai Hospital who works with HIV and AIDS patients. Atchison spoke about how those in the faith community, especially, need to talk about mental health in church. “We don’t speak about taboos from the pulpit, but this is the safest place to talk about them,” she said. The discussion ranged from how school culture affects our children (“‘Man up’ often becomes code for ‘Don’t say anything,’ or “It’s not all right to cry,’” said Reid) to how trauma is sometimes “couched in God’s language,” with sayings like, “I’m too blessed to be stressed,” which can be dismissive of deep-seated feelings. During the Q&A portion, the prohibitive cost of therapy was touched upon, as well as more direct questions on how to choose a therapist or mental-health professional. Reid spoke about continuing to search, even if the first, second or even third therapist is not the right fit. “You don’t do that when you date someone,” said Reid, “you don’t just give up,” so the same should happen when looking for a professional. “Part of handling it is knowing when to ask for help,” said Reid.